In october 2011 me and my girlfriend spend about a week and a half in Sweden. The first few days we were in Malmö and we drove around the very south of the country, then we were a week North of Stockholm. 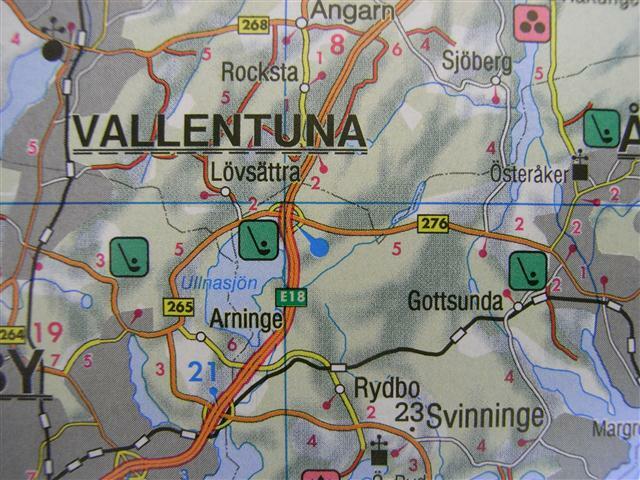 That second location was on purpose, since that region has the largest density of runestones of the Swedish continent (the island Gotland has more). So we figured to spend a week hunting runestones, picture stones, etc. This did not prove to be easy! 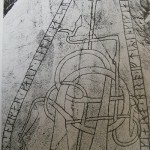 Most of the runic inscriptions mentioned in this book are discussed in greater detail in the volumes of Sveriges runinskrifter – the enterprise known as Runverket (a term also used of the institute responsible for it) – published by the Royal Academy of Letters, History and Antiquities (Vitterhetsakademien). 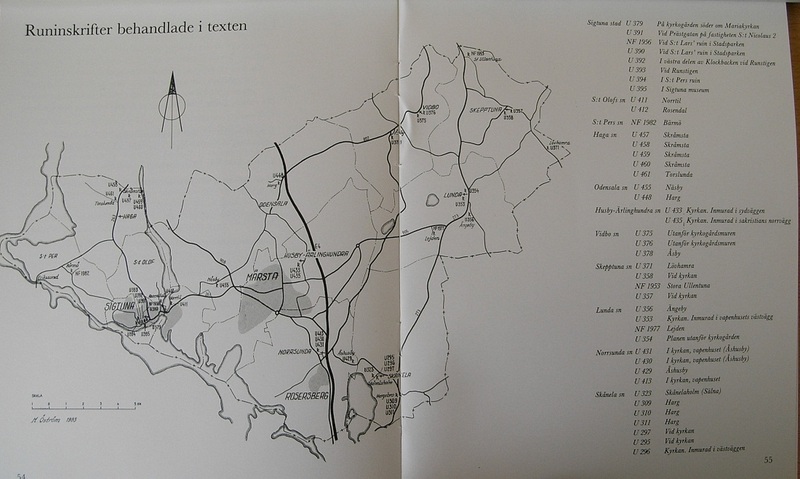 The provinces so far covered are represented by these volumes: Gotlands runinskrifter I-II (1962-78); a third and final volume is expected in a couple of years [the book I quote from is translated to English in 1987]; Gästriklands runinskrifter (1981); Närkes runinskrifter (1975); Smålands runinskrifter (1935-61); Södermanslands runinskrifter (1924-36); Upplands runinskrifter (1940-58); a supplement and introductory survey are in progress); Värmlands runinskrifter (1978); Västergotlands runinskrifter (1964); Ölands runinskrifter (1900-06); and Östergotlands runinskrifter (1911-18). Work on the publication of Hälsingslands runinskrifter has begun, and Runverket has embarked on preliminary investigations into the material from the remaining provinces. This quote comes from the book Runes in Sweden by Sven Jansson and it says that there have been publications on runic inscriptions since 1900! 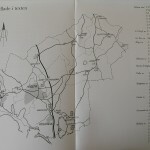 When catalogued, I suppose the stones have been photographed, indexed, described and most of all: the location been noted. More information about the numbering (that I will also use) you can find here (the Runverket project is now called Rundata?). Also about the publications Wikipedia has some information available. 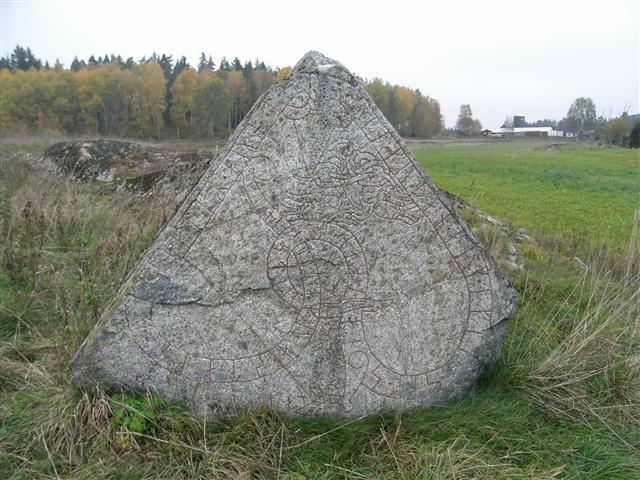 Wikipedia has a lot of information about a lot of runestones, but is in most cases completely unclear of where the stones are. Sometimes the stone is named after the location, sometimes after the person who found it, sometimes after the person who carved it. The good new is that many stones have been moved to the nearest-by church (or have the churches been built on the spot where originally the runestones were?). 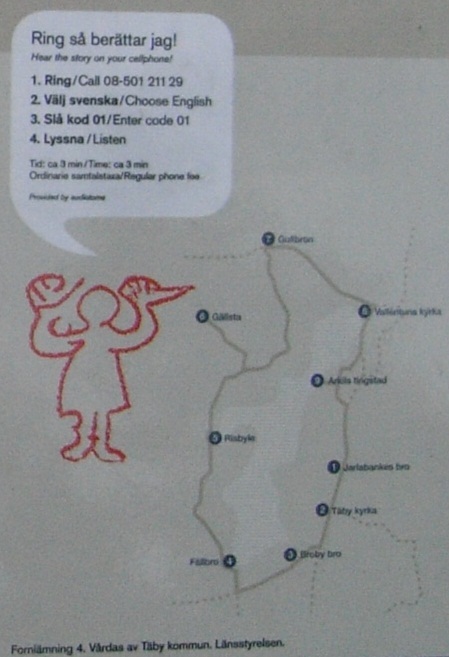 So when you are looking for, let us say, the Lovö runestones all you have to do is drive to the church. In most cases the stones are outside, sometimes they have been built in or are put inside the church. Unfortunately things are not always so easy! 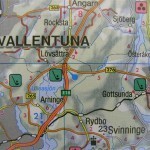 The left image is from a roadmap, scale 1:400.000, so 1 centimeter on the map is 4 kilometers on the road. That means that the image with the three dots (that can be anything old) that you see itself is already 4×4 kilometers large and a slight misplacement will expand your search area significantly! So we bought a map with a scale of 1:50.000, 1 cm is 500 m, still way too big an area. Let me picture the most extreme example. 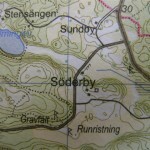 This stone did not have a sign with its U number (it is U 171, Söderby by the way), nor any indication of where to find it. 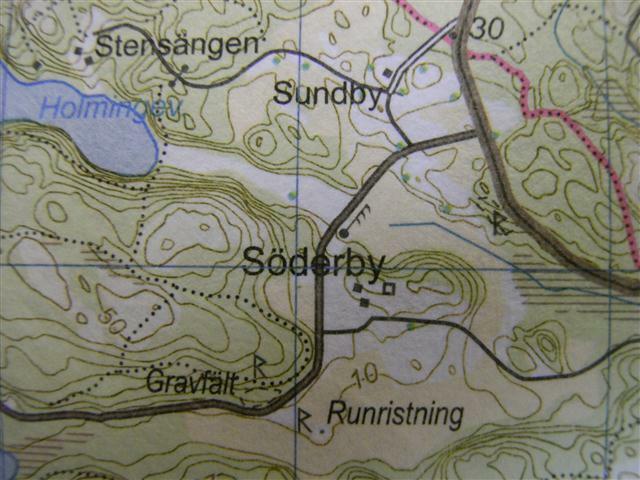 Should you want to follow into our footsteps, on the road 274 (to Vaxholm), take the exit in the direction of Söderby/Bogesund and then an even smaller road in the direction of Röskär (just when you come out of the forest). You will pass a farm and just before the forest you will see a rocky formation in the field. You can park your car on the ‘parking lot’ just in the forest. Walk back to the farmer’s road into the field, walk it to the end and try to get on the rocky formation on the left. The runestone is on the far corner facing the other direction. Somewhere near a crossing… We found the crossing and eventually found the stones too, but it is not like there was a sign to them. The crossing on the map you can find, there is a busstop there. From there go south, over the bridge (which is not Hargr’s bridge) and immediately after there is a grass-path to the right. Follow it for a bit until you see a sign with information. As you can see on Wikipedia, there is not much to see of the inscriptions nowadays. Before we found Hargsbro I said to my girlfriend that it is much more beautiful to leave the stones where they were found, but when you see how they wear off, perhaps a museum, or even a village to keep an eye on them is not such a bad idea. We have seen a lot more runestones. Oftentimes we had to track them down (and ended up at the town church). 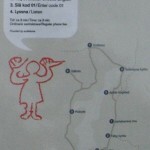 The Sigtuna booklet was the only of its kind that we found. Most stones have an information plate to tell you a bit about it. The stones tend to look the same. 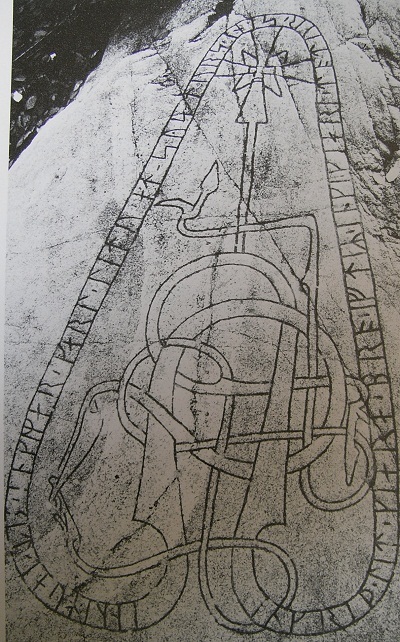 Most of them have a cross in the middle, and a rune-snake with a text in the vein of “Ingríðr had the bridge made in memory of Ingigerðr, her daughter. Ingivaldr (and) Ingimarr (and) Karl had (it made) in memory of their sister.” (U 311) There are some variations on the theme. When you decide to go hunting my advice is: get as much information on the stones as possible. Find out which you want to see and where they are are detailed as possible. When you are going to find them yourself when you are in Sweden, note that you can only find a few a day. 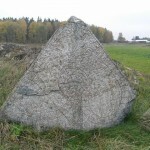 A famous stone like the “Rök stenen” has sign from afar (and from 2012 even a museum again), but even the magnificent and famous “Sigurdsristningen” proved quite a job to find. There are only signs when you almost found it. Wikipedia never says where the stones exactly are (but some do have coordinates!! ), so perhaps we should start adding that information for future travellers (I added some information to the Hargsbro article, let us see if that is not removed in the next days). When you just want to see some stones, go to Sigtuna, Vallentuna church or the Jarlabanke bro (bridge), new Uppsala with several stones behind the Dom church and another 10 nearby in the University park behind the museum that you see from the Dom church’s entrance, or of course a museum such as “Historiska Museet” in Stockholm where the most famous stones are. There are a few places which have information about the location of stones, such as the Jarlabanke bridge and Vallentuna Church. Really, this is as good as it gets. I will give you some more photos of stones that are not on Wikipedia. Starting at the left in the top row you see U389 (at the Sigtuna museum entrance), unnumbered (no runic inscription), U393 Sigtuna, Nf56 (St. Lars ruin Sigtuna, apparently forgotten in the Runverket project), U 385 (st. Lars ruin Sigtuna), U297 Skanela church, U295 Skanela church, U 302/296 Skanela church, an unnumbered stone (front and back) in the open air museum Stockholm where they call it the “Lingastenen”, U481 Lagga church, U929 Uppsala dom church, U933 Uppsala dom church, U935 Uppsala dom church, U932 Uppsala university park, U489 Uppsala university park, U939 Uppsala university park, U937 Uppsala university park, U938 Uppsala university park. To close of, a hint. Runestones are nice, but like I said, they look alike and most of them are hardly heathen. More impressive places are stonecircles, stone ships (stonecircles in the form of a ship), Thing-places, etc. particularly when they also have a runestone (or more). The most impressive place where we were was Anundshög, a place that has seveal stone circles/ships, gravemounds and a large Thing-hill and a runestone. Nearby there is also a labyrinth in the forest. All the way in the south we also visited the Ales Stenar, a ‘ship grave’ that is also a sun observatory. No runestones there, but still impressive, especially during a storm. Perhaps this little story might prove of some use to someone. For the rest I hope that more people that ran into the same issues might add valuable information to Wikipedia (or elsewhere) to help the next person undertaking the same trip.